High blood pressure, or hypertension, can be difficult to control, and treatments range from dietary changes to medications. Because dietary changes mean restricting what you eat, any new food, especially one that seems to have a major positive effect on high blood pressure, are welcome additions. This is often fertile ground for those out to make a quick buck with the latest fad, but in the case of coconut water, preliminary research has shown some interesting results. There are two numbers in your blood pressure reading. The top number, the systolic number, measures the pressure in the arteries when the heart beats. The bottom, diastolic number, measures the pressure in the arteries between heartbeats. For the average adult, a normal blood pressure should be between 90 and120 for systolic and between 60 and 80 for diastolic. Coconut water is the liquid you find in the center of young coconuts. It is not the same as coconut milk; this is squeezed out from the meat of the coconut. As the names suggest, the water is clear while the milk is white. The water is sugary and contains potassium, sodium, calcium, vitamin C and other nutrients. The University of California Cooperative Extension in Sonoma County says coconut water has become a substitute for sports drinks, though the “Los Angeles Times” notes the balance of potassium to sodium in coconut water is much different than in formulated sports drinks. It is the relatively high level of potassium that is getting coconut water attention as a possible treatment for high blood pressure. Potassium, both as the supplement potassium chloride and the food component potassium citrate, can help lower blood pressure. Potassium helps balance out the level of sodium in your blood and keeps your body functioning properly. The American Heart Association notes many of the vegetables you can eat on the Dietary Approaches to Stop Hypertension diet, or the D.A.S.H. diet, are rich in potassium. The idea behind drinking coconut water is that the potassium it contains will function much like any other food containing potassium. One study from 2005 has looked at coconut water’s effect on high blood pressure. 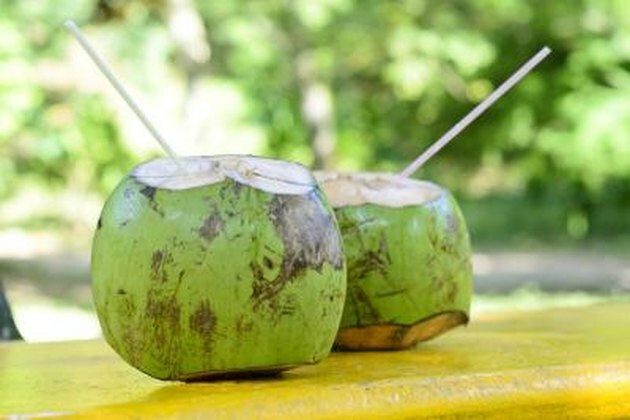 The study in “The West Indian Medical Journal” reported that coconut water did have a definite effect on blood pressure, lowering the systolic pressure by 71 percent and the diastolic pressure by 29 percent in subjects who drank coconut water. Another group within the study received a mix of coconut water and mauby, another tropical drink, and achieved a reduction of 43 percent in systolic pressure and 57 percent for diastolic pressure. As promising as this is, it is only one study. More studies would be needed to verify the effects of coconut water on blood pressure. Hypertension is a serious condition that does require monitoring by your doctor. Even if he hasn’t put you on medication, keep him up to date regarding anything you try. As harmless as coconut water might seem, you don’t want to risk any side effects without a medical professional being aware of everything you’re doing. It is possible to take in too much potassium and harm your kidneys if they aren’t in the best shape -- this is called hyperkalemia and requires urgent medical attention -- which can adversely affect the fluid and electrolyte levels in your body. If you are already using a potassium-based salt substitute or if you have kidney problems, notify your doctor of any increased potassium intake. University of New Mexico: Staying Cool When Your Body Is Hot; C. Vella, et al.